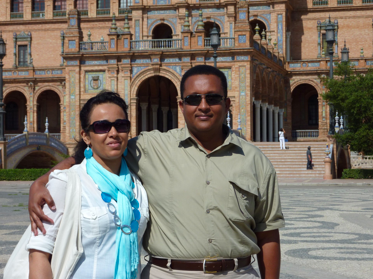 We are a husband and wife team… Both of us were born in beautiful Somalia. We live in Canada, our adopted homeland. We like travelling, photography and food. We love food, but we don’t live to eat. Nor do we eat to live. We live in between. We love to cook and entertain. And we like to share. We want to share with you our love for Somalia and our memories of growing up there. Of peaceful and tranquil times. Somali food is simple. No elaborate sauces or flavour extremes. It is not spicy hot nor is it bland. Through this website, we will attempt to cover all regions of Somalia and we will also venture into neighbouring countries. If there is anything we have learnt from our passion for food, it is about how the world is interconnected, and about our common humanity. Today, Somalia is wounded. We look forward to a Somalia where unity and diversity prevail, where differences are celebrated, where everyone enjoys full rights regardless of race, creed, and gender, and where no one is above the law. Nous sommes une équipe mari et femme…Nous sommes tous les deux nés dans la belle Somalie. Nous habitons au Canada, notre pays d’adoption. Nous aimons voyager, la photographie et la cuisine. Nous adorons la nourriture, mais nous ne vivons pas pour manger. Ni ne mangeons que pour vivre. Nous vivons en équilibre entre les deux. Nous aimons cuisiner et recevoir. Et nous aimons partager. Nous souhaitons partager avec vous notre amour de la Somalie et nos souvenirs d’avoir grandi là-bas. En des temps paisibles et tranquilles. La cuisine somalienne est simple. Pas de sauces élaborées ou d’assaisonnements extrêmes. Elle n’est pas brûlante mais elle n’est pas fade. A travers ce site, nous allons essayer de présenter toutes les régions de Somalie et nous ferons des incursions dans les pays voisins. S’il y a bien une chose que nous avons apprise de notre passion pour la cuisine, c’est que le monde est interconnecté, et notre humanité commune. Aujourd’hui, la Somalie est blessée. Nous espérons que la Somalie redeviendra un pays où domine l’unité et la diversité, où les différences sont célébrées, où les droits de chacun sont respectés sans distinction de race, de religion, de genre, et où personne n’est au dessus de la loi. Leila & Abdullahi. Seville, Spain 2009. Great homepage. I already forwarded the link to our daugthers. Looking forward for more recipies (mufo!!). Keep on going. Thank you Brigitte for your words of encouragement. They will keep us going. Waan ku faraxnay faalladaada waan na ku mahadsan tahay. Waxaan kaloo ku faraxsan nahay inaan kugu kaalmeynay inaad baratid cuntooyinka aan dhaqanka iyo hiddaha u leennahay. Hadduu Eebbe idmo waan soo gelin doonnaa bur saliid. Mahadsanid walaal. AWWB Abdullahi iyo Laila YOU GUYS ARE AMAZING WALAAHI YOU HAVE TURNED ME TO A CHIEF lol I am addicted to your website above all ilaahey cimri dheer iyo caafimaad ha idin siiyo you are the best you are doing an Amazing job keep up the good work Kudos. May God Be with you and Bless you. We are delighted to know that you like the website. Thank you very much for your encouraging words. God bless you. Would like a very well done to you guys, enjoyed the info, and would love to wish you all the very best of success. Thank you, Saeeda, for your positive feedback. We really appreciate it. We will do our best to keep it up. Amazing website! Love the design, the beautiful photos, and the info. I like the Somali xawaash map and the concept of diversity that you expressed so eloquently. Thank you very much for your comment. We hope to keep meeting your expectations. I had wondered why the name “Xawaash” for your website but it made a lot of sense when I pondered over it. The use of spices is almost as old as human history itself. The tiny but fertile islands of East of Africa are sources for several of the finest spices. Some of the spices are going to overlap and be used in many countries. One of the things that make each cuisine its own unique thing is the unique combinations of even similar spices. In our foods, we enjoy the ‘spice of life’ so I do believe that “Xawaash” is an apt name for this website. Very creative and very well done. Congratulations! Thank you for your kind words. Please check regularly for new and exciting recipes. Many congrats and encouragements from your family across the Atlantic (Manchester, UK). I must say that I’m overwhelmed by your website and the birth of this concept. Its Amazing….High class. Loving it totally. All this food display makes me appreciate my mum very much. In this busy and fast-paced world, where most people have replaced our delicious bravanese delights for quick fast-food packages, she still goes out of her way to make all these meals for us. May God always bless her and all those who strive to preserve good in this life. Ameen. Wish you both success in this life and the akhirah. Thank you very much Safiyah for your wonderful comments! That will sure give us a boost. It is nice to know that the effort we put in this website is being recognized. Best wishes to you and all the family. Can I hope/dream of a book? Please, you must work on a book and put all this great work on paper. I want something tangible to pass on to my prodgeny insha’Allah. A book? It is not in our plans for now. If there is ever one, you’ll be the first to have it. Regards. I’m seriously loving your blog, please keep it up don’t stop. I’ve just found your blog today and it is a jewel. Can’t wait to try the recipes. Thank you very much Sarah for your awesome comment. We are currently working on many recipes which we hope to post soon. Recommended by Yousuf. Would love to try it all. Also, the website is very nicely done. Thank you Murtaza. We hope that you will try some of the recipes. I look forward to trying many of your recipes. Especially the breads. I love doing fermented loaves. Thanks for the nice comment. Since you like fermented loaves, we would like to suggest to you to try Bravanese Bread (Maanda). You won’t be disappointed. Thank you, Ato. You said “Baahi aa i qabata” (I get hungry) when you visit this website. What do you do about that hunger? Roll up your sleeves man, and do something about it! Regards. i love your website keep it up. i was wondering one of those days if you could add fress tuna from scratch. this will remind me the time i have spend in brava. thank you for the geat gift you have giving us. We are familiar with that also. We will definitely include it in the list of recipes that we hope to post, God willing. Just stumbled upon your youtube page. I love how detailed and clear your recipes and videos are. Keep them coming! Thank you, Amina. Keep visiting and spread the word! Thank you, Yasmin. We’re happy that you liked it. Keep visiting. I underestimated how divine our Somali cuisine is. Thank you Leila and Abdullahi for what u doing. I long searched for the Cnjala and Bajya recipe. We need to rediscover our roots and appreciate our heritage. Kother, thanks for your comment. Asalama Aleykum! Masha Allah! May Allah bring a lot of baraka to you and your family for all the efforts you have put in to this website. I love the professionalism and the great quality of video and pictures you have posted. I absolutely love the beautiful images and the easy step by step process in to making a xawaash dish. We often eat with our eyes, and all your recipes look exquisite and delicious. I have already tried a recipe and can’t wait to try more mouthwatering dishes. Please keep up the good work and keep those recipes coming. Wa-Aleykum As-salaam! Thank you very much for your comment. We feel touched. May God Almighty bless you and your family. We hope to bring you more and more recipes and while it is a lot of work, we are enjoying it every step of the way. Salaamualaykum, this blog is amazing and I love how you’ve given such detail into the Somali cuisine. As a second generation Somali living in the UK, it can be a little easy to forget about your culture and its cuisine so I’ll definitely be referring to your blog when I have a home of my own and I’ll be using your recipes! Thank you for your comment. However, please don’t wait till you have a home of your own. Invite some friends and whip up a Somali meal. It will be a good practice for you as you showcase your culture and transport them to Somalia. I’m so happy I found you blog, been browsing through your posts and I find everything so fascinating, the traditions, stories, perfect recipes and easy methods of preparations, the design and authenticity. The press is showing Somalia in black and white but your blog is a testimony of how diverse and wonderful your country, culture and traditions really are. I’ll surely be coming back for more vegan/vegetarian recipes. Thank you very much for your comment. We visited your blog and liked it. We will definitely be exploring it more. Thank you for visiting. I just love ur blog,the clean and clear presentation and the wit behind the stories like some of ur video captions, haha very funny. Thanks a lot for visiting and for your nice comments. asalamu aleykum, masha allah, I am in love with your blog, I have been looking for something like this(somali food) for a while, alhamdulilah I found you guys, thank you for sharing with us all, god bless you. have a nice day.. Thank you very much. We hope that you’ll find the recipes you’re looking for. Thanks Sahra for joining the Xawaash family. I am a Somali woman born in Tanzania. I had never been in Somalia but I could smell and enjoy everything from Somalia while living in Tanzania. My father had a problem of integration in Tanzania and his best wishes was to one day fly with his family back to Burco… Somalia. Unfortunately he could not be able to do that and he passed away before he fulfilled his wishes. But what my father did was to make sure that we speak Somali, dance and sing Somali…eat Somali food listen to the beautiful sound of Radio Mogadisho and from that aspect we could feel like we were in Somalia!!!! Later on we had tremendous new neighbors who came from Barawa and hade lived in Mombasa, Kenya before moving to Tanzania, because of their family business which was booming in that part of Tanzania. Through that family I could learn more dimension of differences among Somali people and what that different culture made Somalia to what it was. This story is very long, because I am planning one day to write a book then you may enjoy this story soon…..:-)! Now I want to come to the point why I am writing this to you…First I want to congratulate you so much for the blog with the name Xawaash. For a few days ago a friend of me sent me that blog and I could not imagine that was true!!! I really love you guys!! I live in Sweden since 1986 and would like to follow up you site and even tell all my friends about that. You have made a revolution and keep going!!! If you want any receipt from me I can also send you………! I even like the quote you wrote in your blog…! From Bill Brummel! Thank you for your heart-warming comment. We feel really touched. The way you wrote your comment proves that you are a proud Somali raised by a caring Somali father, may he rest in peace and may God accept him in Heaven. Just by reading your comment we feel confident that you will write an excellent book with very interesting stories. We look forward to it. Once again thank you for your wonderful comment. It is sufficient to keep us going. It’s our contribution to our fellow Somalis and readers as we attempt to share our culture and heritage with the rest of the world. Best regards and wishes to you. Congrats on such a wonderful website, there are alot people like myself who grew up in the west and need help in cooking Somali Food now that we have grown and no longer live with Mom and Grandma. The specialists! Thanks again. Question? Do you guys operate a restaurant? If not, you should. I would love to invest!!! Thank you Mohamed. We are happy that you found the website helpful. No, we don’t have a restaurant. Both of us work full-time in our own company. I’m very impressed with the website and recipes! Thank you very much for putting this together. As a dental student in the United States, it is hard to get good Somali food since I don’t live with family. I had called my mother several times and had her give me tutorials on how to cook over the phone. Now, with your help, I have been able to finesse my cooking abilities and I couldn’t be more happier. Thank you for all your effort and passion for Somali cuisine. Thank you very much. We’re happy that you like the website and the recipes. Mashaa Allah aad ayaan ugu faraxsanahay sida aad ugu dadasheen in aad soo bandhigtaan cunto Somali iyo waliba sida aad creative u tihiin oo waxyaabo fiican aad ugu kordhiseen iyo waliba sida aad u kala dhidhigteen waxyalaha loo bahan yahay markii wax la karinaayo. Very impressive as a couple xataa waad i cajabiseen. Maasha Allah mar kale, ILAAHEEY cimri dheer ha idin siiyo I must say even heesaha aad usoo xulataan markii wax la karinaayo waa qatar I like it. Thank u. What a lovely comment from a lovely person! Aad ayaad ugu mahadsantahy faallada qiimaha leh oo aad qortay. Thanks again. I salute you and my hat is off to you. I do not know where to start because I am very happy and excited to see your food blog. You guys made the most beautiful Somali Food Blog. I wish I can talk to you right now and express how I feel about your wonderful work. Thank you very much Barlin. Your comment means a lot to us coming from the pioneer who wrote the first Somali cookbook, Somali Cuisine. Thank you once again. Asalaamu Caleykum first and foremost i like you thank you both husband and wife for a great blog and great recipes mashallah wonderful blog , I live in sweden. before your website i kind use to travel home a lot, I kind of miss moms cooking. I was student/worker at the time. Now i picked up the cooking and the recipe for this website. Alhamdullilah it is going great thanks to your videos and pics. Now when i go home, I do the cooking and my mom is amazed. She thinks i got a invisible wife that tutors me. Even my closest friends started cooking Somali recipes as we are all students. We thank you and my hat is off for you. Wish you both continue with you work that inspired us. Inshallah i wish you well. Take care. Love from Sweden. Thank you Abdirasaaq. We are very happy that the website was so helpful for you. Thank you for the nice story about your experiences and about how your friends have started cooking Somali food. This by itself makes all our efforts worthwhile. We will keep posting those recipes, God willing, and we hope that you will keep cooking! MaashaAllah you are a wonderful couple we are sick of hearing about war and famine and pirate this blog of yours is a new revolution for all Somalis to come up with creative ideas like yours and erase that ugly image of Somalis.Keep up the good work! Thank you so much, Marwo. That is very kind of you. Let each of us do his/her little part and we will all make a difference. Thanks again for your support. It means a lot to us. Thank you so much for sharing our homeland, Somalia. We feel warmth and welcomed when we watch your well produced videos. We say Mashallah every time we watch your videos. You’re very creative and funny at the same time. Well done guys. Keep up the good work. P.S. Your style is excellent and we enjoy the music as well. Thank you very much, Abdirahman & Fartun. When we started Xawaash, we had a feeling that it will be well-received. However, the response has been so overwhelming and it was beyond our wildest expectations. It just shows that there is a lot of good in the world. I love your work and website! Thank you very much for your comment and for visiting the website. Aad baan idiin ku gobaadinayaa [mahadinayaa], 100%, in aad Xawaash ku soo bandhigtaan cuntooyinka, macmacaannada iyo cabitaannada kala jaad-jaadka ah ee geyiga Soomaaliyeed laga karsado/samaysto. Hawl qurux badan, oo lagu hirto, ayaad haysaan: Eebbe ha idin ka abaal mariyo. Waan ku faraxnay hadallada wacan ee aad inoo soo qortay. Howshaan aan hayno waa mid aan aad iyo aad ugu faraxsannahay. Waxaan aragnay in cuntooyinka Soomaalida ay ka daahsoon yihiin dhallaankeenna, siiba kuwa qurbaha ku korey. Sidaas awgeed waxaan jecleysannay inaan u soo bandhigno si qurux leh, taasoo keenaysa inuu hiddaheenna ugu muuqdo wax ay ku faani karaan. Waxayna ku abuureysaa jacaylka waddanka. should i thank you for the creation of the website,the food or the time you took to respond for each post …….anyway keep up the good work you guys are doing and have and eventful year won’t you ! Thank you very much for the feedback. It is very much appreciated! We like to get feedback and we will respond to questions as well as requests for recipes. Love the site and your creativity. thanks for sharing. Thank you, Sharifetta. Keep watching and get cooking! Can share with us on how to make coodkac please? Oodkac! Wow! We love oodkac and what would a website like Xawaash be without oodkac… Insha-Allah we will post an easy and delicious recipe for oodkac. I’ve already commented on a couple of your videos and I just wanted to say how great your website is. Clearly a lot of effort and creativity has gone into its development. I miss Mum’s food and now thanks to you, I get to try to cook some of these classic Somali dishes. I love the combination of Somali music with the videos. Time to wipe the dust off the stovetop! Faysal, thank you very much for your kind words. Yes, do get cooking, invite friends and spread the love! This is a wonderful idea you came up with. Its so kind of you to share your tasty recipes and help young females like me in the kitchen. I recently got married and my husband loves somalian food. Your site will help me so much and keep my husband smiling hahaha. Thank you so much for the lovely comment. We are absolutely delighted that you found the website helpful. We wish you a very happy and successful marriage. Keep each other smiling! This website must have taken many effort to develop and run. I can tell you have great passion for Somali cousin! Great pictures, well done! I also have one passion, that many of my friends know: I make and drink Camelachino! That is coffee made with fresh camel milk instead of cow milk. I have pictures, so, guys, if you want to share it on your menu, I will be more than happy to send you all the information and the photos you need! Camelachino We love it! Send us the pictures together with some camel milk. Congratulations on a job well done. The website looks amazing! Somalia cuisine and culture is well represented in the videos. The attention to detail is obvious! Keep up the good work!!! Thank you very much, Biljana! Thank you for your words of encouragement and for taking the time to comment. I’ve come across a few Somali food blogs, but the professionalism and authenticy of your blog is quite amazing. I’ve always thought Somali cuisine had great potential to become more mainstream – dishes like Kalaamudo are hidden gems (though I always make a point to my mum of adding potatoes!). I’m a student and not much of a cook; though I do have your website bookmarked! Maybe I’ll attempt one of the recipes, instead of waiting to go back home for mum’s cooking. I hope more people discover your awesome blog, and I definetely recommend you think about writing a book on Somali cuisine! Thank you very much, Majid. We are glad you liked the website. You are right about Somali food. Our diversity has given us such a rich food heritage that we can be really proud of. You said you like potatoes with your Kalaamuddo and that is perfectly good. We have a recipe for Kalaamuddo using mashed potatoes in making the dough. It makes the Kalaamuddo lighter (similar to Gnocchi). We hope to post it with a video some time in the future. Thank you for taking the time to comment and we wish you well! I love your website and your cooking and everything looks nice. I am very amazed with your work. GOOD LUCK and keep going. Thank you very much, Nexhmija. We hope that you will try Somali cooking. Thanks again! I’ve always wanted to find a website that had somali recipes. Thank you guys, this is great! and professionally done. keep the vids coming. Thank you very much for your kind words, and for taking the time to comment. Wow, masha-Allah! This website is awesome. Your introduction is superb and aamiin to your hope for a brighter day. I am getting married this summer and this made me even more excited about starting a new life with my fiance. We will definitely be using website to create some great dishes. Thank you for sharing your passion with us!! – If possible, I would love to see a recipe for Cambaabur (Eid-food). Thank you very much, Hanna. We wish you a very successful marriage and a wonderful new life. Let us know if you need help with any dish! We will post Cambaabur in due time, God willing. Soooooooo glad i found your blog, i have finally found decent Somali recipes that i can practice and then cook for my husbands large Somali family. Thank you soooo much for sharing your Knowledge. I look forward to reading more of your blog inshaAllah. Thank you very much, Safiya. It’s our pleasure. We hope you will impress your in-laws. Don’t hesitate to ask if you need anything clarified. We are also excited to come across enthusiastic individuals like yourself. Thank you for sharing your thoughts with us. You put a smile on our faces. Masha-Allah walaal Khalid. Hadalladaas oo kale waa waxa na dareensiiya inay hawsheenna noqon hal bacaad lagu lisay. Mahadsanid! Thank you very much, Muna, for the the very nice comment. Coconut (qumbe) is on the top of the list. We will post it soon, God willing. I love you guys, I never thought there are great Somali chefs like you. I was confused how to make cake ‘Doolsho’ I googled and I found you two, I really thank you and wish you every success. Thank you, Mahmoud. Isn’t it wonderful to google Somali words and get the results you want? We are not chefs, but just regular individuals who try hard to achieve good results. If someone did a good and very beneficial website, this is it. As a former Restaurant owner, I salute you guys. Very creative and smart couple, keep up the good work. Allaha idin barakeeyo. Thank you very much for your comment, and kind words. Thank you for the comment and the nice words. We all have to be proud of our beautiful Somalia. Jazaakilaah khayr. salaam L&A. your website is amazing. i just recently discover that i have passion for food and your website just inspired me even more. i would like to learn and enjoy cooking amazing recepies but most of time i seem to be at lost. my husband is also a picky eater which limits me from trying new things but i am wondering if there are ways i can work around what he like and still try your wonderful recipes? i know is a weired question but i had to ask lol. May Allah bless you for sharing your passion. Thank you for the comment. You can do slight changes and still enjoy cooking. You have to be careful with baking recipes. Thank you and God bless you. Amazing blog – simple and so well put together. Great photography. Now I don’t have to worry about learning all these recipes from Mama! Jazaakallah! Thanks a lot for your comment. Start cooking! Thank you very much. We hope that you will explore the website and find what you are looking for. This blog is still new and we are regularly adding new recipes, so please check back for the latest recipes. Woow there maybe no other well organized Somali food web page than what this husband and wife team has shared with us…I’m really impressed and will definitely show this site to my wife…I realized you guys write in Swahili…do you guys speak swahili too?…myself I’m a Kenyan Somali living in the States. All your recipe seem yummy. Seems like y’all know what flavor brings out the beauty of Somali food…really enjoyed your effort! We speak a dialect of Swahili spoken in Brava, Somalia. We can understand Swahili but we can’t speak it. Thank you very much for your comment and we are happy you liked the website. Can we hope that you will surprise your wife with a dish or two? A friend recommended this blog on Facebook, and it’s really exciting for me to find it! I live far away from my Somali friends and all the great restaurants and cafes I used to go to in Minneapolis. Also, I now eat a plant-based diet, and so it would be great to be able to make the dishes I love using vegan-friendly substitutions. Your instructions are so clear, and the photos are fantastic! Waa mahadsantihiin! P.S. I love the spice map. Thanks a lot for your comment. We have a few vegan recipes we hope to post soon. Beautiful and well done blog. Now i can brag Somali recipes:-) thanks to you! Thank you. Somali food is indeed amazing. It is a product of our diverse heritage. Great blog. Enjoyed reading it. Thank you very much for taking the time to comment and letting us know your impression of the website. I found your blog via Clutch Magazine. I hope to frequently visit walaal. Thank you very much. We would appreciate if you could send us the link. We didn’t leave any comment there. We heard about Clutch Magazine from you. Thank you. Asc, please make a shushumow video if you can. I will apreciate it very much. I love your videos, they are very useful. Jazakilahu kheyre. We are working on it. We will post it soon. Thank you. Thank you so much for your comment and positive feedback. Stay tuned for more recipes. Walaal waad ku mahadsan tahay faalladaada fiican. Waxay nala tahay haddaad niyaysatid inaad karin karto. Cunta kariska wax adag ma-ahan, qofwalba hadduu niyaysto wuu karin karaa. Thank you very very much for your comment. It is appreciated. We will make one, God willing. In the meantime you can use the recipe from the Bajiya post or Makarooni Isku-karis. Runtii waligay ma arag webset ka fiican. Waxan ahay wiil somaliyed oo jecel cunto karinta. waxa aan aadaa barnaamij cunto karinta ah oo mudo 3 sano ah, hal sano hadda ii haray. Runtii websetkaani waxa aan bartay 15/05/2012. ilaa iyo maanta wax wayn baan ka faa iday. Waxan aad u jeclaa cuntooyin soomaali ah. waxa inta sii dheer in aad somali ku turjunten. Aad iyo aad baad u mahadsan tihin. allah idinka dhigo idinkana kuwa nolol raaxa leh ku noolaada aakhira iyo aduunba. Adigaa mahadda mudan. Waan ku faraxnaa markaan maqalno wiilal Soomaali-ah oo jecel cunto kariska. Waxbarashadaada iyo noloshaadaba guul ayaan kuu rajaynaynaa. Mahadsanid. salam from all the way from london, i am so addicted to your website. I want to congratulate you so much for the blog with the name Xawaash. Thank you so much for your warm greetings from London and for the nice comment. Asalama Aleykum, Masha Allah! You have created a wonderful blog, congratulation!!! You have made us very proud to have a culture with a wonderful food. Wish you both more success doing what you love to do. Thank you so much for your encouraging words. We hope to keep meeting your expectations. Thank you very much for taking the time to comment and thank you for your recommendations. We will post a video for malawax in time for Ramadan, God willing. I am a student studying in beautiful Vancouver. I came across this website when I was navigating the web, searching for Somali recipes like a year ago. Alhamdulilaah I have learned so many things. Thanks for the time you dedicated to professionally presenting Somali food to the world. We are happy the website was helpful. Thank you for the nice comment. It is appreciated. Thank you for your comment and nice words. We hope that you try other recipes. Your website is extremely well done and appealing. Congratulations to you both. I love the simplicity and richness (at the same time! )of the somali culinary tradition. I would love for it to be translated to French. I was thinking that I’d love to have the recipes at home, I’d ask for a book but today the easiest way to publish is an android/apple app. I would buy your app if you had one, for sure. Think about it guys. Thank you so much for the fabulous comment. We have now embedded a translation tool into every page. There is a drop down menu under the title of the recipe. There you can select the language of your choice. The translation is not perfect but it does a satisfactory job. We have been thinking to make an app for Xawaash. When we make the app we will announce it and it will be free for everyone. Thank you very much for your interest in Xawaash. Thank you very much for the toolbar. I tried it and it wasn’t satisfying, it ruins your commentary, the most important part, and I don’t think it’s accurate enough. I’m going to test translating “by hand” English to French, if I come up with something good enough I’ll send it to you. You are right that the machine translation falls short on many levels. When we read some of the translations we had a good laugh about some of the funny things that we read. However, the translation did a fairly decent job when it came to the ingredients. Some friends told us that their relatives who did not speak a word of English, were able to follow the recipe from the ingredients translated into their language and the video which showed the steps. Thank you for offering to translate. We would indeed be very grateful to you. asc sister how are you and your family i hope your all well jazokilahu kheyre for showing me and everybody how to make shushumoow thank you once again. We are all well, we thank God. Thank you very much for the special greeting and the comment. Thank you for making this website to help those bring a piece of home with us everywhere we go. I left home and live in Germany, so having this website will soon bring the memories and feelings as well as taste of home, and the love from my mother all the way too me . Thank you and God bless! We are happy that we helped you re-establish the connection with our motherland. Let us know what your favourite recipes are. In my book you guys are ‘seria A’. God bless you! Thank you very much Shamsa. God bless you. salam alikom Abdullahi & Leila I hope you all in great health ,, would you please tell me the brand name of the vegetable spices you often use “the yellow powder” since i also live in Canada. We use Vegeta seasoning mix. You can find it in most supermarkets (Food Basics is one place you can find it). Ramadan Kareem. Aad iyo aad ayaa ugu mahadsan tahay faalladaan wacan. Iskaashi wuxuu dhaliyaa isjeclaan. Salam and ramdaan kareem 3alykum. I just saw your vidoes on youtube and I really like them. Your recipes are amazing,the way you making them so easy to do is enjoyable to watch.love your kitchen its cleean, keep up the good work . Thank you very much for your fabulous comment. Ramadan Karim. You can use a heavy, round bottom wok. You can find it in some Indian stores (ask for Karahi or Kadai) or in Chinese supermarkets. The one we used is from Brava, Somalia. Ramadan Karim. Beautiful site. Exceptional recipes. Great Team. I’ve tried a couple of your recipes; your directions are thorough and simple to follow. I’ve begun to enjoy cooking and be proud of final product. Thank you. Thank you for your generous compliment. It is really appreciated. Ramadan Karim. I love this website, your youtube blog, simply everything. You two are a great wonderful team, and thank you for showing that we can make great food in Somalia! Thank you so much for your compliment and encouragement! Your comment add us wings. Thank you guys for everything. I love you guys because you guys cook or make things that I love to eat. and then show us old Somali, Yaa salaam! !, and the songs. but my number one thing that i love about you guys are, you don’t waste time to talk and talk and talk,. you guys are AMAZING!! please keep up the good work, and please more of our good food. Thank you for visiting and thank you for your wonderful comment. we are happy to know that you enjoy the recipes and the songs. There are more recipes coming and we hope you will like them. Okay I would love to get perfect Macsharo, but it is getting hard on me. I did follow everything you told me but it is not working for me. I did put the whole bag pf rice flour. it says 2-lbs. you know what I am thinking maybe the bag I am using is little so much. and it burnts quickly even though I used low heat. please tell what wrong things I am doing. The recipe says 400g rice flour which is less than one pound. You used 2 pounds, which explains why it is not working. Please also make sure that you use non-glutinous rice flour. We are sure you will get excellent results if you follow the recipe closely. I would just like to say that you have created a blog which is just simply amazing Masha’Allah. Mabrook! I am happy to see alot of bravanese foods that I and every other Bravanese and other Somali people loves. I wish you all the best and keep up the good work! I’d just like to ask, are you both Bravanese(from miini)? Thank you very much for your comment. We are Bravanese Somalis. We hope peace and prosperity (Nabad iyo Caano) will come back to Somalia. thank you, my Macsharo came out perfect and muufo too. can you guys show us how to make “” Kackac, Icun, and Nafaqo. We are very happy for you. Thank you for letting us know. God willing, we will post everything you asked for in due time. Thank you for your comments. God willing, we will post other recipes of muufo. Thank you for your patience. Thank you for taking the time to comment. We are happy to know that you like the website. God willing, we will post other variations of muufo. I really like using your website it really easy to follow step by step.i’m really bad at cooking but thanks to your website i’m starting to learn to cook.Jazakallah Khair. Thank you for your nice compliment. Keep cooking and soon you will be a great cook, God willing. We will start working on the Eid sweets soon. Hadduu Ilaahey yiraahdo waan soo dadaalaynaa. Mahadsanid. Thanks loved ones Leila & Abdullahi …. Mash Allah, we can see that u r a wonderful family and I pray may Allah bless u. I am a 16 year old girl living in Sweden and I was born in Hargeisa, but I grew up in Sweden Stockholm, and my mother learned to cook from scratch, but that was exactly what we somalian usually eat . Now I usually read almost every day your blog is a wonderful website and I try to cook the nice recipes that you post tx. it is so dat my mother ever ask you that Allah will bless u. so we are grateful for what you created we..llllll done. Hibo, that is a lovely comment! We are so happy that you are learning how to cook at such a young age and that you are helping your mother. Thank you so much for being a regular fan. We hope to post recipes that you will like. God bless you and your family. Waxaan nahay SomaliweynTV oo kasoo galo magaalada Gothenburg ee Sweden, Waxaan u baahannahay inaan idiin lasoo xiriirno si khaas ah/private, waxaan rabnay meel aan idiin kala soo xiriirno. Hadduu Eebbe idmo waan kula soo xiriiri doonnaa. Mahadsanid. You can shape them in anyway you like. You can keep them for 2 days in the pantry or up to a week in the fridge. Thank you. We know the ones you are talking about. They are called Buskud Somali and some people confuse them with Kac Kac. They do not have any eggs and are cut into a diamond shape. Kac Kac does not last more that a few days whereas Buskut Somali can last for a very long time. God willing, We will post a recipe for it. Thanks for the question. Abdullahi Kassim & Leila Adde. Waxaan rabaa inaan Halkaaan idin kaga mahad celiyo Kun jeer ka badan Shaqada aad heesaan. Wallaahi as a young man Ramadaan ka hor cuntokaris waxaan ka aqaanay Bariis iyo baasto. Laakin Indhaha ayaad ii furteen. Bishii ramadaan kaliya 10 nooc oo kala duwan oo cunto somali ayaad i barteen. si aan idin kugu mahad celiyo na ma aqaano. Walaalahega waxaan idin leeyahay Cimri Dheer, Waligeey soomali idin ka fiican ma arkin. Walaal Xasan, aad ayaan ugu faraxnaa markaan maqalno in laga faa’iidaysanaayo Xawaash. Waxaanna ugu faraxad badan dhalinyaradeena Soomaaliyeed inay ka-faa’iidaysanayaan. Aad iyo aad ayaa ugu mahadsan tahay faalladaan wacan. Ciid Wanaagsan. Walaasheenna qaaliga ah waa loo xiisay qoraaladaada iyo ducooyinkaada. Aad iyo aad ayaa ugu mahadsan tahay faalladaan qaayaha leh. Ilaahey waxaan ka-baryaynaa umuurahaada inuu kuu fududeeyo adiga iyo muslinka oo dhan. Qayr ayaan kuu rajaynaynaa. Ciid Mubaarak. You should not use glutinous rice flour. This recipe works with a specific type of rice flour that we show in the post. The package has 400g of rice flour. You can find it in asian supermarkets. If you use the right type of flour and follow the directions, you should get it right. If you don’t have a scale you can measure 3 and 3/4 cups. Curry powder is a mix of spices which includes turmeric powder (huruud). Thanks for the question. Thank you sister Ifrah for your nice comment. Barakallahu fiiki. We already posted kac kac. God willing, we will post buskud Somali in the near future. Thank you. Congratulations to YOU…I am so proud of you. Such an amazing family, Maasha’Allah. WELL DONE! Thank you so much for your kind words. It is great to do something you enjoy and be praised for it. what I am saying my family call it kac kac, some other people call it buskud somali. I know you guys already post it that. You are right. We heard some people call it kac kac. Back in Somalia we knew it as buskut Somali. It is harder and can be stored for much longer than kac kac. We will post a recipe for it before Eid, God willing. on a more serious note, jazakum allah kul khair for amazing and easy to follow recipes. Annaga intaas ayaan wax idiin karineynay. Marka…goormaad naga nasin doontaa ood na-casumaysaa? Waa ku-mahadsan tahay faallada fiican. Asalaamu calaykum, i am currently a university student studying in london away from home. so it does mean i have to cook for myself and i do miss my hooyos home cooked food immensely. Alhamdullilah i bumped into this site if not i would still be eating fastfood and pre-cooked supermarket meals. This website is great and the recipes are easy to follow and within my budget. I have a lot of friends and they’ve been impressed by the food and are happily embracing the food side of Somali culture ahaha. What you two great individuals are doing is awesome and i wish you the best with everything in life, may you and your family be blessed. Thank you very much for your awesome compliment. We were truly touched to read your comment. We wish you and your family all the best. May God bless you. Thanks again. Oh my god i don’t how to express my self this moment im really crying i found this website i don’t know how to thank you guys, you very kind and wonderful people, im very grateful i found my sweet somali food after long time of depression and loneliness i tired eating junk noodles, i really like to support this website to keep a live if there’s a way. keep the good work and thanks again. Thank you very much for your enthusiastic comment. We are really happy that you found the website helpful. Your comments is enough support for us. Thank you. Axsanto walaal, waan ku faraxnay hadalladaada. Waxaan aaminsan nahay abaalgudka ugu fiican inuu yahay ducadiinna. Inoo duceeya, intaas ayaa nagu filan, anagana waan idiin duceynaynaa. Waxaa tihiin walaalaheenna aan jecelnahay. Mahadsanid. First of all, I want to thank you both for creating such a wonderful and colorful website. I just discovered your website now and it’s just so good to see all of these recipes who most of them reminds me back home thanks to both of you. Now, when my friends ask me to talk about somali food, I can suddenly show them your fabulous website and even better, I can cook and get some ideas from your delicous recipes. What else can I say? well done and keep up the good, warm, spicy ideas about our food that brings family, friends, and loved ones to share happy moments over lovely meal. Thank you very much, Santal. Thank you for visiting and writing such a sweet comment. Get cooking and share with your loved ones. I’m looking forward to trying out the recipes. Thank you and keep up the great work. Thank you very much for your nice compliment. We hope you will like the recipes. Happy Eid. Ciid Wanaagsan walaal. Waa ku-mahadsan tahay booqashadaada waana ku-faraxnay. Hadduu Eebbe idmo wadankeenna oo fiican oo barwaaqeysan inaan iskugu imaano ayaan rajaynaynaa. Mahadsanid. Thank you both for creating this absolutely gorgeous website. I am so inspired and touched. As a passionate cook married to a Somali Canadian, I will put all these recipes to use right away! Thanks a lot for your beautiful comment. It is appreciated. Please let us know how the recipes work out for you. Thanks again. Thank you for your comment. We hope to make an app for Xawaash, God willing. Aad iyo aad ayaa ugu mahadsan tahay faallada fiican. Waan ku-faraxnay inaad jeclaatay waxaanna rajaynaynaa inaad ka-faa’iidaysatid. Mahadsanid. I just made my first karis of Xalwo, I am emotional, turned out great. I left Somalia when I was 7 and live all the way in Australia. I have tried making caano baraawe from memory and never understood why it wasn’t turning out right, now I know! your blog is not just about sharing recipes (which in itself is an amazing project) but also showcasing what can be present when there is peace in people’s lives. I was born in Moqdisho but came though Barawe when we were fleeing the war, we stayed there for 2 weeks and I always say that baraawe is a special place. Thank you, thank you thank you! Thank you so much for your nice compliment and words of encouragement. We are happy that you liked the recipes and found them useful. We hope to post “Caano Baraawe” soon. We wish you all the best. Also where can I find the songs from the caano baraawe clip and songs of that kind. I like to share Somali music with non Somalis especially non synthesised kinds like this one. Does this Habib fellow have an album that can be downloaded or I can order a CD and pay for it? We got a CD as a gift. It is hard to get nice Baravanese songs, specially Habib’s since he passed away a long time ago. By the way, the recipe is for meeso not Bravanese fudge (Caano Baraawe). God willing, we hope to post it. Thanks for your patience. What a great website and a great couple. mashalah may god reward you for your efforts and what you are doing for somalis and non somalis that have interest in our culture and food.Your site was recommended to me through a freind and boy am not dissapointed! As a wife i usualy make something new for my husband and he loves my food, so i am looking forward to trying all your recipes. Thank you so much for the site! With love all the way from Australia! Thank you so much for the fabulous comment and thank you for the words of encouragement. Have fun exploring Xawaash. We hope you will like the recipes. I discover your site by accident. After so many years of crisis in Somalia, I lost all hope for better Somalia. Seeing people like you and your wife it gives me hope for Somalia. Thank your very much for you guys effort and may Allah reward you. I am so proud of you guys. Thank you so, so much Shafici, for your generous compliment. We are delighted that you liked the website. We need more people to show the positive side of Somalia. Thank you once again. I am a huge fan of your website and constantly visit it to learn more on somali food. I believe the young generation of Somalia dispersed worldwide can learn how to cook their native food and not lose our Somali roots. I myself live in south east Asia and the only way I get to improve my Somali dishes is through your website. It really taught me alot and I intend to share this website with my friends and family. Keep up the good work, all the best and I look forward to seeing many new ideas from you. Thank you very much for your nice compliment and so friendly words. We are very happy the website made a good impression on you. Thank you for your words of encouragement and for spreading the word. Mashallah first let me say what an amazing website both of you created, I have grown up in America where I don’t know how to do some of Somali food like the cookies and bread. Can’t wait to make it today all thanks to both of you bring back memories Mashallah shukran for this wonderful website and blessing us with ur amazing food. there’s one thing I was hoping to make I am a fan of cashaati please I was looking around haven’t seen that Inashallah soon ill keep on looking for that. Can’t wait to try making all of this inashallah. Thank you so much for the wonderful comment. Here is the link for the Kashaato recipe we posted before http://xawaash.com/?p=2967. We hope you will like it. asalaam. walashiisa iyo walaalkiisa. salaan kadib walal aad ayan waxan u jeclaan lahaa in aan arko idinkoo diyaarinaya laba niyad (custard) oo somalia laga cuno gaar ahaan xalfadaha iyo aroosyada. wax faah faahina hadii aad rabtaan fadlan ila soo xiriira. Aad iyo aad ayaa ugu mahadsan tahay faallada fiican. Hadduu Eebbe idmo waan soo gelin doonnaa kastar (cutard). Mahadsanid. We are not happy with the recipe that we have at the moment and we are working on how to perfect it. Thanks for your patience. ooh ok I thought that you guys have it and just like me who do not have time thank you again. Walaal Abuu Abdirahim, waxaan hadalkaada ka fahmay inaadan qurbaha joogin. Walaal annaga meeshaan aan joogno ragga awood ma lahan. Haddaan isku dayo inaan meeshaan sawirkeeda ka saaro, aqalka ayaa layga saari doonaa. Jazaaka-Allaah. I love your website and recipes MashaAllah. I can’t wait to start making the anjera and your other recipes. Pls Keep going – We all need to be reminded of how beautiful Somalia is and used to be. Thank you for your kind words and for stopping by! May God, bless you. What a fantastic site and awesome food culture! Actually, words fail to express just how great this site is! Thanks for the detailed procedures and stories behind the dishes. We were delighted by your fabulous compliment and motivating words. We are happy the website had a good impression on you. Your comment is deeply appreciated. Thank you very much. I was wondering where can I get the cookie attachment for my Kitchen Aid to use in making the Buskud. i live in the US. Look for KitchenAid food grinder. You can find it at Sears or Target. You will need a cookie press, the one we used is from Somalia. I have the grinder, what I need is the cookie cutter. Is there a way to buy it from Somalia? If you have relatives back home or anyone you know, they would be able to find it for you. I just really wanted to commend you both for what you’re doing. The presentation of the site is phenomenal and the recipes are amazing. I hope you continue with this project, we all enjoy it. I no longer live close to my Somali relatives and I wish I would’ve been more attentive to my hooyo and ayeeyo when they cooked, but this is a great second best. Mahadsanid! Thank you very much for your generous comment. We are happy you like the website and the recipes. We are also happy about your enthusiasm for cooking and it is never too late to learn. Marka waa idin salaamay akhayaarta, Runtiin aad iyo aad ugu helay xawaash.com, waxaan soo xasuustay waayo waayo, waxaan kaloo ka helay in dadka ajaaniibta ey si fudud arki karaan somali food.. guys well done. Aad iyo aad ayaa ugu mahadsan tahay salaanta wacan iyo faallada fiican. Waan ku faraxnay inaan waayo waayo ku xasuusinay iyo inaad ka heshay goobta Xawaash. I’m very proud to see a very creative couples like you guys, representing our food and culture. i really appreciate the passion you have for cooking, the energy you dedicated, and the time you invested to share and create http://www.xawaash.com. waad ku mahadsantihiid waxa aad qabateen walaalayal in kastoo ann aniga wax kariska ku fiicnen ama passion keyga aheen lakin waxad igu dhiira galisen wax qabadkiina, waana jeclahay dad wadaniyin ah oo contribution sameynaya somalinino darteed. Thank you very much for your awesome comment. We were truly touched to read your comment. We are glad that our humbled efforts have pleased you. Thank you. Wow. Soomaali sidiina u mitid ah bathi ma arko! I could very much appreciate it (insha Allah ta’ala)if you shared with us the secret behind your self-discipline? Its inspirational. Perhaps you could even share with us tips to help us develop our discipline too. Thank you very much for your great comment. We appreciate your kind words. Hopefully we will write something about it. Xiriiriskiinna ayaa billad inoo ah. Aad iyo aad ayaa ugu mahadsan tahay faallada qaayaha badan leh aad inoo soo qortay. Qayr badan ayaan Ilaahay kaaga baryaynaa. Mahadsanid marlabaad. Masha Allah waan idin salaamay runtii sitekan xawaash.com waa site si fiican looga shaqeeyey lagana faaiidaysan karo cidii u bahaan inay waxa ka barato. Sitekan qolyo ila shaqeeya ayaan siiyey xataa isku dayey samaynta cutadeena aadna uga helay. Waxaan idin leeyahay hambalyo shaqo wacan qabteen. kasii wada halkaa insha allah. Kolay cunto badan aanan aqoon ku arkay aan rabo inaan barto.mahadsanidiin. Mahadsanid walaal Edil. Waan ku faraxsan nahay inaad jeclaatay Xawaash. Waa ku mahadsan tahay inaad cuntadeenna iyo dhaqankeenna aad la wadaagtay asxaabtaada. Qayr ayaan kuu rajaynaynaa. Walaalayaal, salaan kadib, mahad alle kadib, waxaan rabaa inaan idiin mahadceliyo websitekan aad u quruxbadan aad samaysayn. Waxaan si khaas ah ugu xiisay sawirada dalkeena aad videoyada ku soo darteen, mashaAllah. Illaahay ha noo hagaajiyo dalkeena. Hadii aan idin suaalikaro, ma sawiro private ah baa? Walaal Sucdi, aad iyo aad ayaa ugu mahadsan tahay faallada aadka u fiican iyo hadalada wacan. Qofka sawiray wuxuu ku qoran yahay fiidiyaha aaqirkiisa. Mahadsanid mar labaad. waa markaan oo kale markaan ka laba labeenin in aan qof amaano, masha allah wax wanagsan oo aad u wayn baad qabateen, runtii aniga ahaan aad baan ula dhacay sida waxkastaba aad isugu dheelitirteen, the slogan ama astaanta ka tarjumaysa wadankii iyo cuntatii halma qofki sameyey aad buu u maskaxbadnaa…….waxaa kale oo aad cajiib u ah afsomaliga carabiga iyo englishka ..haka tagin heesaha macaan iyo sawiradda, waxaaba dhihi karaa xitaa dadka somaliyeed ayaad baraysaan sida aanan loogu xadgudbin xuquuqa qofkale sida sawiradisa, marka laga soo tago cunta karinta marka howlo badan ayaad halmar qabanaysaan……kaliya waxaan idin dhihi karaa alle ha idin nabadgaliyo, riyadiinana ha rumeeyo hadii ay kheerka idinkugu jirto aamiin aamiin. Walaal Maxamud, waa ku mahadsan tahay faallada sharafta leh iyo amaanta. Aad iyo aad ayaan ugu faraxnay sida aad ula dhacday Xawaash, waxaan kaloo ku faraxsan nahay waxa yar aan qabanno inay kuula muuqdeen wax wayn oo wanaagsan. Ilaahay ha kaa abaalmariyo, qayr badanna ha ku siiyo. Mahadsanid. Runtii aad & aad ayaan iduunku mahad naqanayaa, bayjkan dhawaan ayaa la ii sheegay aad banan ugu farxay aniga oo arkin, markaan arkayna waxaan ogaaday in aanu ahayn just a website, laakiin uu yahay waxtarwayn oo anfacaysa dhamaan dhalinyara soomaaliyeed meelkasta oo ay joogaanba. Anoo filiya in guryo badan oo soomaliyeed laga furidoono bagekan lana daawan doono Fiidiyowyaada kujara, waxaan jeclaan lahaa in heesaha ku korduuban vidioga ay noqdaan heeso wadini, goobaabin iyo dhaqameed ah. kuwaas oo u noqon lahaa gobaabin dhalinyaro badan oo soomaaliyeed. Sida heesahan. Adigaa mahadda mudan walaal. Aad iyo aad ayaa ugu mahadsan tahay hadalada wacan oo qiirada leh aad inoo soo qortay. Waxaan ku leenahay ku soo dhowoow goobta Xawaash. Waa ku mahadsan tahay heesaha aad inoo soo dirtay. Your recipes are just lovely. Having said that you have made error in the Somali chutney ingredients you have 1.25 cup (300 ml)salt, in your video it 1 Tbsp (15 ml)salt and tomato paste 1 cup in your video its 1.24 cup (300 ml) tomato paste. I thought of pointing it out so you can put it right for your readers. Thanking you. Thank you very much for pointing out. We will fix it. Hadalada wacan Ilaahay ha kaa abaal mariyo walaal. Mahadsanid. Walaal Cabdifatah, waan ku faraxnay sida aad ula dhacday goobta Xawaash. Waxaan kaloo ku faraxnay waxa yar aan qabano inay kuula muuqdeen wax weyn oo Soomaali wax tar u leh. Xaaskaaga salaan naga gaarsii. Ilaahay waxaan idinkaga baryaynaa qayr badan oo aan dhammaan. Mahadsanid walaal. Adigaa mahadda mudan walaal. Waa ku mahadsan tahay faallada wacan. Thanks for the link to your website – I love it and I’ll be sharing it with many friends!! I am going to try many recipes. 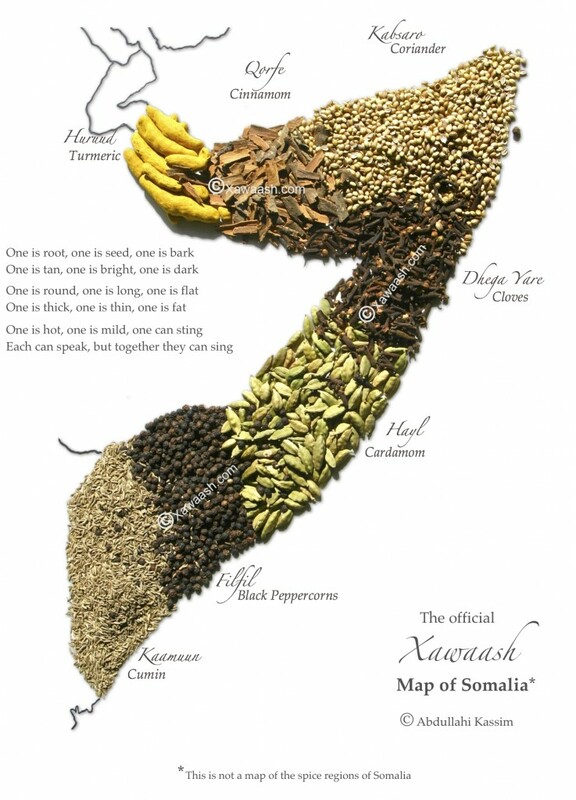 I also love your very original (spice) map of Somalia – beautiful. You are most welcome, Tracey. We are very happy you loved the website and that you will be sharing it with your friends. Thank you very much for visiting and for taking the time to leave a comment. ASA. I am from Kenya. My mum is Kenyan and my dad is Somali Kenyan. I grew up eating Somalian food all my life, curtesy of my grand mum and aunties, but never learned to cook it. I moved to the US at age 18 and unfortunately never learned how to make my favorite Somali dishes. I am now married to a non-Somali and I always wished I could cook genuine Somali food in my home. Thanks to your website, I now can. I have made the xabaash spice and it is a staple in almost everything I cook in my house. You have taught me so much and I want to thank you sincerely for this site and what you are doing for Somalis all over the word. You guys are great and Insha Allah you will continue to share with us the rich Somali culture that many of us know nothing about. Thank you very, very much! You delighted us with your wonderful comment. It sure will keep us going. We are very happy we could help and we wish you happiness and success in your life. Aad iyo aad yaan idiinku mahad celinayaa Abdullahi, Leila & dhammaan intii wax kaga qeyb qaadatay websitekan qiimaha leh. Thanks! Adigaa mahadda mudan walaal. Waan ku faraxnay faalladaada. Never seen somali food cooked in such measured classy way. Do you guys have cook book, and do you do Restaurant Consultanting? Thank you very much for your kind words and nice compliment. No, we don’t have any cook books and we do not do restaurant consulting as yet. nice picture and looking good both of you…. masha allah ha idin dhowro !!! Thank you very much. We wish you all the best. Thank you very much for your wonderful comment. We hope you will try the recipes and let us know how you like them. Take care. Thank you very, very much Sacad, for your generous compliment. We were very happy and touched to receive such an awesome comment. We don’t deserve all that praise, but thank you for your generosity. May God bless you. We thank you alot for this great contribution to our mainly undocumented Somali food culture. With the help of your Shushumoow recipe, my daughter and her Dutch Classmates enjoyed a very funfull afternoon preparing and baking Shushumoow at school. Thank you again and keep on publishing more recipes. Thank you very much for your comment. We are really happy to know that they had a successful food project. It is great that your daughter shared Somali food with her classmates. Thank you for sharing the story with us. I really want to thank you about your generosity and free tutorials of our Somali food, I’m Somali student I live China and before this website I really didn’t know how to cook even the smallest dish, and I got sick this country’s food, this website helped me a lot and I thank you again. Please keep your passion towards our homeland and home-food. Thank you very much Ahmed, for your generous comment. We are very happy that you found the website helpful. By the way, we love, love Chinese food. Runtii, waxaan idiinku mahadnaqo ma garanayo,Ilaahay uun baa gudi kara xaqiina aad u gasheen umada ka faaidaysata idinka khayrku wuu idiin soconayaa. Walaalo anigu waxaan arday ka ahay dalka Turkiga markaa wax la dhaho International Cuisines Exhibition ama bandhiga cuntooyinka qaramada aduunka, waa nalagu casuumay. Waxaanu halkaa ka geysaynay la’aantiin may suurto gasheen, dadkii halkaa isagu yimi ee cuntooyinka qaramada dhandhamiyay iyagoo farta qaniinay oo leh cuntada Somalidaaanu ka helay leh ayaa halkaa ka tageen. Mar labaad aad baad u mahadsantihiin, wanaag iyo badhaadhe ayaan idiin rajaynayaaa lamaane barakaysan baad tihiin. Walaal, annagana wax aan kugu mahadnaqno ma naqaan. Waxaad noo soo qortay faallo aad iyo aad u fiican. Idinkana goobtaas sharaf iyo guul ayaad Soomaalida u soo hoyseen. Waa wax lagu farxo. Horumar iyo baraare ayaan Eebbe idinkaga baryaynaa. Aad iyo aad ayaa u mahadsan tihiin. Thank you very much for your heartfelt comment. May you be loved by all. Waa ku mahadsan tahay slaanta wacan iyo faallada fiican. Ilaahay ha kaa abaal mariyo. Qayr ayaan kuu rajaynaynaa. The best food blog yet! I love your thoughtful approach to cuisine, cultures and politics. Thank you and as long as there are more people like you, our region will be a better place. Thanks for the cooking lessons on YouTube. Some of it remind me of the food I had in Harrer growing up, and it speaks to our connectivity beyond borders, race and creed. <3 God bless you. Thank you very much Eden for your generous comment. We appreciate your kind words and we hope to strive to become the way you described us. We had Harari friends and they were always close to our hearts. meesha aad ku duubeysaan musiga iyo heesaha. Waa ku mahadsan tahay faallada iyo talada. Qayr ayaan kuu rajaynaynaa. Horumarku waa dadka sidaadoo kale wax u habeeya oo la qaybtama aduunka . Walaal adigana nabad iyo naxariista Alle. Waa ku mahadsan tahay hambalyada iyo ereyada wacan aad inoo soo qortay. Xulbadda af Ingriiska waxaa loo yaqaanaa “fenugreek.” Hadduu Eebbe idmo waan ku tala jirnaa inaan soo gelino sida loo sameeyo. Waa ku mahadsan tahay slaanta wacan. Waxaan aad ugu faraxnay kalsoonida aad nagu qabtid iyo sida aad uga heshay Xawaash.com. Waa arin aad u fiican inaad maqaayad weyn ku leedihiin magaalada Oslo. Wixii aan idinkugu caawini karno diyaar ayaan idiin nahay. Waxaa nagala soo xiriiri kartaa emailkeenna mail@xawaash.com. waxaan rabii inaa nii weediyo see loo sameeyaa xulbo. Waa ku mahadsan tahay faallada. Hadduu Ilaahay yiraahdo waan soo gelin doonnaa. Qayr ayaan kuu rajaynaynaa. Ugu horayn waan idiin mahadcelinayaa si niyad ah, taasoo ay sabab u tahay sida hufan ee aad u caawinaysaan dhamaan bahwaynta soomaaliyeed, gaar ahaan aniga oo aad iga caawiseen dhinaca cunto karinta oo xaqiiqdii aanan soo koobi karin sidaan ugu baahday cunto karinta. Waxa ay ahayd markii iigu horaysay oo aan kasoo tago reerkayga, kadib markii aan shaqo ka helay shirkad caalami ah oo iisoo dirtay DRC. Waligay cunto ma aanan karin taasoo aan hubo in ay dhaqan soo jireena inoo ahayd, sababtoo ah markii aan yaraa Hooyaday iyo Gabdho walaalahay ah oo badan baan ku soo dhex koray, ka dibna Xaas baan yeeshay oo aan kusoo wareegay gurigayga. Si kastaba ha ahaatee anigoo ay talo igu cadahay oo aan dhihi karo halis baan qarka u saarnaa dhinaca cunta xumida, ayaa waxaan Youtube ka helay programs kiina oo aanan soo koobi karin amaantiisa, kaasoo marka laga yimaado dhinaca cunta karinta, ay aad iisoo jeedisay sida uu uga turjumayo Soomaalinimada iyo siday idiinku wayn tahay, ha ahaato dhaqankeena, heesaha, sawirada oo dhamaan ay yihiin kuwa loo diyaariyay si cilmiyaysan oo u sahlaya qofkasta oo idinka baranaya cunto karinta, taasoo ay idiin dheertahay sidaad u gudbinaysaa dhaqankeena suuban oo aan hubo in taariikhdu idin xusi doonto, sida hanka leh ee aad ugu naaloonaysaan dhaqankeena. inkastoo aan ku dheeraaday qoraalka, hadana waxaan mar labadaan iyo ka badan idiinka mahadcelinayaa sida aad ugu gurmateen dadkeena soomaaliyeed oo xaqiiqdii dhibaada bur burku uu ka saameeyey meel walba oo nolosha ka mid ah, taasoo aan hubo in maalin uun aan noqon doono dad dib u dhista dalkooda (Qofku waa kii kufa ee hadana kaca). Walaalayaal halkaa ka sii wada dadaalkiina aad ugu jirtaan Umadiina iyo baraarujintiina wadaniyada iyo qaranimada. Waa ku mahadsan tahay salaanta iyo faalladaada oo aan aad ugu riyaaqnay. Waxaad tahay walaal qaali ah. Waxaan ku faraxsan nahay in inta yar aan samaynay ay wax tar kuu noqotay. Hadduu Eebbe idmo dadaalka waan sii wadi doonnaa. Mahadsanid mar kale. Aamiin walaal. Laba nooc sambuus ayaan soo gelinay. Hadduu Eebbe idmo waxyaabo kalena waan soo wadnaa. Ramadaan Kariim walaal. I’m thrilled to learn about your website, I can’t express how greatfull I’m. You are doing a fantastic job and we are so proud of the amazing somali food recipe you posted I will for sure be using it a lot . Masha Allah may Allah keep you safe keep up the good work guys. Thank you so much for your generous comment. We are gladdened that the content of our website has met your approval. God bless you. Alle ha ku jeclaado. Aad iyo aad ayaa u mahadsan tahay walaal. Waan ku faraxnsan nahay inaad ka faa’iidaysanaysid. I absolutely love love love your website, and your Youtube tutorials even more! God bless you in your work! Thank you so much for your lovely comment. We wish you all the best. Curious where is the best place to buy xawaash spice mix? You can buy it from Somali markets. Thank you. Hambalyo walaalo waxaad qabatay howl aad u wanaagsan! Mahadsanid walaal. Jowska ma’ahan loos. Waa wax cuntada lagu carfiyo sida heylka iyo qorfaha oo kale. Hi there guys, i just want to say what a amazing couple, Im not much of cook but my wife is, so Bravo guys.And I had to share your website with all of my friends on FB. So keep up the good jobs guys,Im soooo proud of you guys. Thank you very much for your kind comment, and thank you for sharing the website with your friends. It is one of our objectives to have the maximum number of people benefit from our website. Af Soomaali wuu ku qoran yahay. Thanks for sharing your tasty recipes, I tried the turomba and liked it so much.. and going to try your chicken soup.. and i think it will be great as the first dish i tried from you! Thank you very for your kind comment, and thank you for your confidence in us. Ramadan Kareem sister. Walaalayaal waxaan idinka soo salaamaynaa Bristol, UK. Runtii waxaad tihiin dad akhyaara oo kaalsooni ku qaba dhaqankooda iyo cuntadooda. Xaaskaygu aad ayay u jeceshahay websitekiina waxaana uu runtii noqday meel aanu ka eegano kolba cuntada aanu is leenahay tijaabiya. Aad baad u mahadsantihiin, halkaana ka haya Ilaahay ha idinka abaal mariyee. May ALLAH bless you Leila and Abdillahi and all of us, and may PEACE prevail in our country and in this world. I really like your website and it’s so professional and easy to follow. since my friend suggested to me I can’t log off from it. GREAT WORK, GREAT LOVING PEOPLE, GREAT ROOTS OF US. Amen. Thank you very much for your kind words of encouragement and for your prayers. We are happy that you love the website. We wish you all the best. Thank you. You Guys ROCKS …. caadi matiihiin keep it from wiil jiro 17 oo dagan sweden,borlänge .ö. Assalamu Alaikum Leyla and Abdullahi… How are you and the family? hopefully everyones well.. Eid Mubarak. Anyways this is Jija, ya Amina osman daughter from NY… Anyhow I love your site.. I wished i knew about this when i got married because I didn’t know how to cook at all. So Ive struggled a lot with the kitchen and went out to eat most of the time.. But when I saw your site several months ago. Im constantly in the kitchen and want to try cooking something new.. I swear I’m on your page every single day.. I think my mom called you and told you. Im so thankful for this site wallahi, it has helped me a lot. Thank you so much, Jija. We are very happy to hear from you. We are also happy that you found our website helpful. God willing, we hope to see you soon. I would like to express my gratitude for this wonderful and beautiful website. I never thought soomaali food could be this dimensional and this great. I love the fact that you have videoclips that go along with your recipes, it makes it easier for people like me who find following recipes a tad difficult, to have a go at them and hopefully succeed. Thank you for this website and I love your spice map and the wordings that go with it, indeed we are all different but it is by embracing these differences we can have a better and more beautiful world. A superb website, Allah barik! Thank you very much. We were absolutely delighted by your lovely comment. We hope that you will like the recipes. Thank you very much for your wonderful comment. We are very happy that you like the website. God willing, we will post two videos for all future recipes, one with music and the other without. We have a category for healthy choices and we will keep adding to it. I am intrested in making a simliar site. Please respond if you can tell me how you made the website. waad mahadsantahay. God willing, we plan on creating a page on our website that will explain in full detail how to create a website exactly like Xawaash. We will list all the software tools we use photography as well as video editing techniques. Bonjour A&L je suis vraiment très fière de vous, vous êtes vraiment une source d’inspiration pour moi. Je ne savais absolument pas cuisiner les plats de mon enfance et grâce à vous j’ai appris. C’est mon mari qui vous remerci aussi de nous avoir sorti des restaurants et de la nourriture sans saveur que je lui preparait. Maintenant je regarde une de vos vidéo et le tour est joué plus de dispute sur mes talents culinaires . Merci sincérement du fond du coeur pour votre devouement et l’effort que vous mettez dans vos vidéos. Elles sont claires, precises et sans difficulté. Ps: avez-vous penser a écrire un recueil de recettes ou un livre de cuisine? vous avez beaucoup de talent mashaalah. wow mansh allah the most beautiful and food entertaining website i’ve seen guys congrats!! Aad iyo aad ayaa ugu mahadsan tahay faallada wacan. Waan ku faraxnay inaad jeclaatay goobta Xawaash. Middaas run baad ku sheegtay, in Xawaash uu yahay waxaad nala leedihiin. ana mid wanaagsan baari ii ah igu soo duceeya akhyaaray. Aad iyo aad ayaa ugu mahadsan tahay hadalada wacan aad inoo soo qortay. Waan ku faraxnay faalladaada. Adigana Ilaahy ha kuu sahlo mid qayr qaba oo kuu roon. Mahadsanid marlabaad. I just got married and you can’t imagine how much this website has been to help. Thank you so much! You are most welcome, Sabrin. We Wish You a Life full of Smiles and Happiness. You can find them at the supermarkets, department stores or online. thank you for your blog. thats all i can say, walaahi. you have enspired me to cook! Thank you for letting us know. We are very happy we could help. Thank you very much. God willing, we will not stop. We wish a very happy New Year. Thank you for this wonderful and very informative blog. I can’t imagine how much hard work and dedication you’ve put into it but know that both of you are leaving a treasure of history and knowledge for generations to come. As a Somali who grew up in the diaspora I know nothing about the food of our people. Moreover, as we are mainly an oral-based society, it’s almost impossible for our parents’ generation to pass their knowledge to our generation and thereafter. So thanks for doing this wonderful and priceless work. I hope one day you will both be recognized for being true heroes of Somalia and national treasure. May Allah protect and reward you; Aamin ya rab. PS: A quick story of how I found your blog. I bring and share my food with my best friend and colleague at work so today I brought a Shushumoow for snack and he loved so he asked me the name of it as he often does so I told him. I usually stop there because I don’t know anything about how my mom makes the dishes so today I decided to Google to find if there’s anything about Shushumoow that I could share with him. To my amazement I found your blog with not only the recipes and how to make them but with video instruction! Now my buddy asked his wife to make for him I’m hoping to try a Shushumoow made by my buddy’s Pakistani wife! Thank you very much for your heart-warming comment. We feel really touched! It is nice to know that the effort we put in this website is being recognized. We enjoyed reading the story about how you stumbled upon the website. We wish you all the best. Thanks to all your efforts for creating this brilliant website. I am a very innovative person, i love to be in the kitchen trying out new recipes. As i am from Britain, I always love to watch cooking programs like Masterchef and The Great British Bake Off. But having tried your recipes, i find it SO much easier to follow and it turns out GREAT so thanks for all your hard work! Keep producing fab recipes in the future plz! Thank you very much for your wonderful comment. We are very happy that you found the recipes so easy to follow. We hope to continue posting more great recipes. We wish you all the best. Masha allah what a wonderful website this is ….Thank you so much for posting all of these yummy recipes, you have inspired me to be a better cook and may Allah subhaana wata alah reward you both for all your efforts ameen. Thank you very much for your nice comment. We are delighted you found the website helpful. دائما يوجد رد سريع على تساؤلاتي …كما يوجد حلول بديلة لمن لا يمتلك الأدوات المطبخية التي تستعملونها..
أهنئكم على الإبداع …وفي انتظار المزيد من وصفاتكم الرائعة. walalayaal allaha khayr idinka siiyo sida wanaagsan eed us oo bandhigteen cuno somalida waana wax lagu faani karo runtii. Mahadsanid walaal. Aad iyo aad ayaan ugu faraxnay faalladaada. Waa ku mahadsan tahay salaanta iyo faallada wacan. Waxaan kaa baryaynaa cabirada inaad si fiican u raacdid. What a joy to have found you. I love the arty way you present the food. I am mesmerised with the beauty and the love that shows through the pictures, music and videos. What an awsome pair of embassadors you are for your country Somalia, for Africa, and humanity. La cuisine ne m’a jamais touché aussi fort comme je l’ai senti en regardant vos creations artistiques. Une grande rencontre entre art et cuisine. Je vous aime sans jamais vous avoir rencontré. Un frére du Maroc en Autriche. We are delighted that you have found our blog. Thank you so much for your heart-warming comment. We feel really touched. Hard work is never futile. Hands down best recipe website ever! Never thought i’d be able to cook such delicious somali dishes for my family, being a person who was born and raised in the west! May Allah swt reward you for your effort! What a wonderful comment! Thank you very much for the feedback. It is very much appreciated! Thank you for your wonderful comment, and thank you for your confidence in us. As far as the decorating, we will work it into our recipes. Thank you very much for your comment. May God Almighty bless you and your family. my name is mohamed abdirahman hassan and i appreciate you guys what you are doing,i learned how to cook through you website and i subscribed to your youtube channel, which i learned there and it is 2 yrs since i started learning how to cook atleast for now i know all the basic somali food which i appreciate you guys your hardworking and giving back to the society and i am leaving to you a qoute saying ”everyone wants to be appreciated,so if you appreciate someone,don’t keep it a secret. Thank you very, very much, Mohamed. Your comment is much appreciated. We are very happy that the website was of help to you. We wish you all the best. Thanks again. Thank you very much, Muna. We are very happy to know that. I came across your YouTube channel while looking for Basbusa recipes and am so glad I did!!! Thank you for all the simple and clear instructions. As a new bride and housewife, this is great way to start my cooking. Thank you very much for your comment. We wish you the best in your new life. I hope this blessed Ramadan reaches you in high spirits and goodwill. My mum came across your website last year and since then we’ve both been hooked. I’m able to cook your orange juice cake with my eyes closed and the results always surprise me. My mum has cooked half the recipes on your website, all so tasty I forgot that somali traditional food could be so yummy!! This Ramadhan you’ve cooked for us! Your delicious shourba, your apple fritters, your fail-proof bajiya, your easy honeycomb bread. I’m so thankful for this website. Its simplicity and its easy to follow instructions. I owe you a world of thanks. May your family always be blessed and in good health. What a lovely comment from a lovely person! Thank you very, very much, Amina. Your comment means a lot to us. Ramadan Kareem to you and your family. رمضان كريم وشهر مبارك . انا كذلك سعيد جداً بمعرفت موقعك وقناة اليوتوب واشكرك على الجهد الكريم . عرفتها لان لدي اصدقاء من الصومال في اندونيسيا . I, truly want to thank you both for making this website possible.Some of us,are second or third generation of Somalian’s.And, we don’t know our traditional dishes. My husband surely appreciated my efforts to make some of our own foods. I have one suggestion to make, which is work on your recipe finder. Sometimes it takes me a longer time to find a specific dish. Thank you very much for your kind comment. You are right it is something we are currently working on. Thanks for the feedback. Thank you very much for taking the time to comment. We are happy to know that you are using the website. Thank you very much, Niya, for your kind greetings, prayers and lovely comment. It is nice to know that the effort we put in this website is being recognized. We are delighted to know that the website has been useful to you. Thank you very much for your encouraging words. God bless you. From Djibouti, I would like send my warmest congratulations. I encourage you to go forward and pray to Allah that you do enjoy his mercy because he is the most merciful. I wish you a long life to you both. Merci. Thank you very much for your comment and prayers. It is appreciated. Thank you very much, Faiza. We are delighted you like the website. Aad iyo aad ayaa ugu mahadsantahy faallada qiimaha leh. Wax badan ayaan ku faraxnay hadalada wacan aad inoo soo qortay, waxaan kaloo ku faraxnay inaad ka faa’iidaysatay cuntooyinka aan soo gelinay. Ilaahay ajar ha kaa siiyo cuntada aad ardayda la wadaagtay. Mahadsanid mar kale. Waa ku mahadsan tahay salaanta wacan. Decorating bag ama piping bag iyo decorating tip. Haddaad fiyoore ka samaynaysid waxaad u baahanaysaa tipka 1M. Shirkadda samaysa Wilton ayaa la yiraahadaa. Hello Layla and Abdullahi, I have been coming to your website for a very long time and I absolutely love the recipes. You’ve done us Somalis so proud by showcasing our wonderful culture! My daughter recently came to visit after going to a friend for afur, and she told me that she tried a Somali dish called Kay Kay. I may be getting the spelling wrong here, however I was wondering if you were familiar with this dish and if so we’d both love to see a recipe from you please. Also, xaneed as it’s a great dish but quite complicated to prepare properly I think. Thank you very, very much for your wonderful comment. We know KK and we will post a recipe for it, God willing. Markuu Inankayga Xamze dhashay gurigana la keenay isaga iyo Hooyadiis ayay noqotay inaan Jikada hawsheeda la wareego , waa qurboo xigto iyo xigaalo gacan kusiiyo meesha kama dhawa , Xawaash.com ayaa ceebtayda Asturay , Aad ayaad u mahad santihiin Ilaahay wixii wanaag ah oo dhan ha idin solansiiyo , xumaan oo idilna eebbe wayne ha idinka hayo. Marka sheekadu waa xigto, xigaalo ama Xawaash. I was so tempted to try out your Lentill soup recipe and it turned out really good except one thing I was missing XAWAASH powder. I live in Edmonton AB, wondering where do I find this powder in here? We are happy to know that. Here is the link for for the Xawaash Spice Mix http://xawaash.com/?p=12. hello cabdullahi, as a young man I don’t see cooking as a career but a house chore, in that u don’t cook u’ll starve or u will go to eat from a restaurant. very funny ,especially when girls and mom are there to cook, . Anyway am a great cook and to be honest I don’t follow any recipe but I love ur cooks u are very straight u help Somalis all over to know some recipes for translating them kudos, one day u’ll get old and who knows that I might replace u. Have a great day,would u? salam aleiykum i want to buy the same kitchen aide mmixer as you. which kind is it and does it come with the cookie presser thing that you used. We use KitchenAid Artisan series. The cookie press is from Somalia. Walaal, ma aynaan fahmin su’aashaada. You are most welcome. We got the cookie press from Brava, and it is number 5. Yes, we are from Brava and we do speak Chimini. also sister i was making the pound cake and you used the vanilla extract and i went to go buy it. but when i read the ingredients it said that there is alcohol in it. is it ok to use still??? You can find vanilla extract without alcohol such us Foster Clarks, or you can use vanilla bean or vanillin powder. Waa ku mahadsan tahay salaanta qaaliga ah iyo faallada wacan. Waxaa fiirisaa qaybta caafimaadka uroon. Hadduu Eebbe idmo waxyaabo kalena waan soo gelin doonnaa. I love your cooking may Allah have mercy on you and your family. Aad iyo aad ayaa ugu mahadsan tahay hadalada wacan aad inoo soo qortay. Qayr ayaan kuu rajaynaynaa. Mahadsanid mar labaad. Thank you very much, Fatma, for your kind words. You need to follow the recipes closely; you will also need to use measuring cups. The best way to get in touch with us is through our email mail@xawaash.com. Waan ku dadaalaynaa, hadduu Eebbe idmo. Mashallah great work! do you have any e-mail to send you a question? Here is our email mail@xawaash.com. You have given to Somalis the greatest and the most precious present one can give to them: you have given them an identity; you have shown the world that Somalia has something to offer humanity, and that Somalia is not necesarilly always a place of conflicts and miseries as we are given to believe through the world media. Thank you very much, Rage, for your words of encouragement. It is nice to know that the effort we put in this website is being recognized. We feel really touched and motivated to do even better. We wish you all the best. Thank you again. I have nominated you as the Richest and Biggest contributors to Somali art and culture over the past three decades. Giving a worldwide exposure to Somali cuisine and enriching our tastes with beautiful flavors coming from your homeland. Infinite thanks for your work I hope you will able to write a book for the generation to come also for those who are not lucky enough to discover you on the internet. Everything is clear and concise and the dishes exquisite are beautifully presented…Bravo!!! What a wonderful comment! Thank you so much for your very kind words. salaamu aleikum i really liked your program of cooking keep up the hard work. I live in manchester if i want the buskut machine ( the multi mashine you used for the biscuit ) where can I get please. I have never in my life commented on any website. But your website has left me so thrilled. Being a Muslim I feel so proud of your work, and excited of what our Ummah can do. Mashallah your professionalism is outstanding, in fact I end up watching your videos twice. Initially I become mesmerised by the quality then I remember that I need to watch what you are making so I have to play the video again. Mashallah your thoughtfulness like having the video with music and without is truly a blessing. I have only tried you Mamoul recipe and judging the way my boys have devoured them, they were a success. So not only do you give professional quality recipes, they even work. May Allah swt grant you success. In duniyah and the akhirah! Thank you very much for your kind words of encouragement. We are absolutely delighted by your lovely comment and very happy to hear from you. God bless you. One last thing, please write a bit more about yourselves. Your background. How this all began?How you work as a team? All of this sounds fascinating. Mashallah. Thank you very much. Insha’Allah, we appreciate your interest in our work. I’ve seen all your videos on youtube and can not get enough! Your recipes are very successful and well-explained everything. Sometimes I miss the size of the pan or round shape that you are using but beyond that, there is absolutely nothing to complain about. Wish you could make a good recipe that cake soaked in syrap and cut into fine squares. The cake should both have semolina and flour. It should be slightly crumbly in texture on. Hope it goes to fix! Otherwise, why will it not new recipes? Everything what comes from you is good! Your food recipes are superb, I was wondering if you could please make Falafel recipe video withi tahini sauce. Firstly, you two do a fantastic job cooking up great meals, sharing your recipes, and maintaining this website. My family and I Thank you guys so much for everything. This Android app is based on some of your works, it basically generates and sorts some of your Somali Food lessons and automatically adds new recipes you record on to the app. The app can be installed to any Android phone or device by using Google Play Store on your phone. On google play, search for: Somali Food. Hope you share this with everyone of your visitors. asc www waxaan jeclaan lahaa eboow iyo aabaay inaad isii saan receitka 3kg oo xalwo ah insha alaah!! Hi my name is mohamed khadar I am a 20 year old from London England who currently resides and studies university in Cairo Egypt. I live my with a couple of other guys and had lots of difficulties cooking food since my hooyo used to do it for me.then I came across your website and I wanted to tell what two beautiful couple and humans you are. You took your precious time to help people and making difference to people life’s, I can not speak for others but to me you guys have made a lot of differences to my life and I wanted to thank you for your hard work. May Allah grant all your wishes and make both of you happy in your life’s. Waan idiin hanbalyaynayaa. Waan idinka mahadnaqayaa dhaqanka iyo dhadhankeena aad inoo soo bandhigteen. Intaa ka dib, waxan ku noolahay U.S. Waxaan aad u raadiyaa Shaahii hooday karin/samayn jirtay oo kale. Hooyo anoo yar ayaan Soomaaliya kaga imid, intaan ka soo maqnaana way geeriyootay(Allah yarxam). Maan ka baran shaahay samayn jirtay, walaaladayna may ka baran. Marwalba oo aan isku dayo inaan shaahiiyoo kale sameeyo, mid aan la dhadhamin karin ayaan sameeyaa. Ma soo bandhigi kartaan sida shaaha loo sameeyo? Waxaa laga yaabaa inaanu keedii oo kale noqon balse meel aan ka bilaabo ayuu isiinayaa. I just got ur video by chance I was searching for a receipt to make baqlawa’s filo and was soo surprised to see a somali made video that explains it. this was so amazing and surprisingly great to see somali channel witha professional work. Im hereby congratulating u guys and wishing u a brighter future. and thanks for the heads up ur giving to our broken Somalia. I see ur restaurant is finished and although am far from canada but if it happens that I come there oneday ur restaurant will be my first destination. Mashallah, I love all of your recipes! I use them for Ramadan and my family loves them. Thanks! I was wondering if there was any way to get in touch by e-mail? I was hoping to speak to you about your project. Came here to tell you how much I love your Youtube videos. Thank you for teaching! Masha Allah Great thing, Very helpful in all ways. May Allah Almighty Bless You and Your Family. Hi there, Do you have an email address that we reach you on? Masha Allah you are doing great job. may Allah reward you Hazanaat as you are helping His people. I personally appreciate you because I am learning from you now as I am getting ready to be a husband soon. I am heavily impressed by the way you are linked as a couple, a husband and a wife and as lovers! Keep up with the kind and good spirit I am sure you will succeed in life. Please tell me the name of their restaurant. I am visiting Canada soon, and would love to eat at their restaurant. and I love to learn how to cook somali food. my neighbours are from somalia. we share a lot of goids together and we really enjoy this loving accepting energy. can someone from this website please email me directly? I work in a museum with a large Somali collection. We are interested in interpreting some objects relating to food preparation and are looking for some information. thank you. Thanks for the basbousa recipe! I looked at so many on the web, and I can tell yours is the best. I can’t wait to make it, especially with that delicious milk fudge sauce. Please don’t think everyone in the USA is like Donald Trump. There are millions of us who want to deport HIM! موقع لطيف ومفيد ومرجع ثقافي وفني للبلد الجميلة :الصومال .. ونافذة مطلة نحو كل شيء له رائحة زكية وطعم لذيذ وشكل مدهش ليس للطعام فحسب بل لكل شيء ينتمي للإنسان العظيم..شرف لنا معرفتنا بكم .. رعاكم الله وألهمنا وإياكم كل خير يقرب منه ومن حبه .. شكرا لكما كثيرا أطيب الأمنيات لكما بالسعادة في كل اللحظات طبتما وكونا بخير . Maasha.allah guys. Really good idea and good work. I love cooking and I have a passion for the kitchen. Thank you very much for your website. I really enjoyed for the preparation of Kac-Kac and I will do as soon as possible insha.allah. I’m from Somalia, living in Italy since 2008. Thank you Xawaash Restaurant. Your food is very delicious and the service is very nice.I would definitely recommend everyone to taste your meals. Aniga Maarekin Somali. Unfortunately that is all that I can remember these days. My wife, Carole, and I lived in Merca and Mogadishu before you were born. We were part of the first group of Peace Corps Volunteers to live and work in Somalia from 1962-1964. We came to love Somalia and the Somali people. We get to drive from LA to San Diego occasionally to buy sambusi, eat semi-Somali food, and spend a few hours in a Somali tea shop talking to old men about what we remember of the good days and tell the younger men of what they have missed and unfortunately will never get to see. What is interesting is that the teashops look like Mogadishu and, most important, smell like Mogadishu. It is all good…charcoal smoke, steaming milk and tea, rich spices, crisp meat, lamb, the occasional goat, but unfortunately no camel, no camel milk. I am so very happy to find your web site and your recipe for Xawaash. I will be making a large batch this week. Do you also sell it? We have a on line group called Friends of Somalia. It’s made up mostly of the couple hundred Peace Corps Volunteers who served in Somalia in the good days. Three of the RPCV’s just recently returned from acting as Election Poll Watchers in Somaliland.